Oof. There are troubled productions and then there’s Spider-Man: Turn Off the Dark, which has experienced a crippling combination of financial difficulties, on-set disasters and critical maulings since it began previews late last year. Now, Deadline.com is reporting that the producers have hired Roberto Aguirre-Sacasa to rewrite the book penned by director Julie Taymor and Glen Berger. Extensive rewrites will likely result in a sixth opening night delay for the $65 million production, as there’s no way this bizarre take on the Webslinger can be wrangled into coherence by March 15. 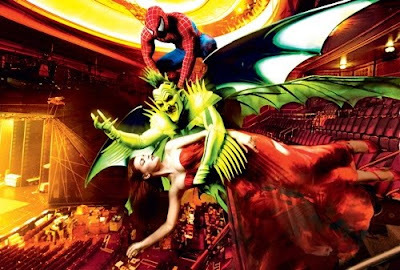 Hell, from what I hear, the play features a supervillain fashion show and a Mary Jane-sung song about shoes. Thanks, Bono and The Edge! But there is a flicker of hope in hiring Aguirre-Sacasa, who actually wrote several issues of The Sensational Spider-Man back in 2006-2007. Unfortunately, the playwright’s credits also include a recent reworking of the questionable 1960s Man of Steel musical, It’s a Bird…It’s a Plane…It’s Superman. Don’t expect much.